Today finishing up this historical/opinion piece by Konstanin Merinov, posted on Yury Gagarin’s birthday. As I mentioned before, Merinov poses the question: “What would Gagarin himself think of our current situation in the space arena? As a temporary setback or a chronic illness?” The rest of the post is dedicated to this question. Merinov obviously believes that the contemporary Russian space program leaves much to be desired. And on the end of the pitchfork, of course, would be Dmitry Rogozin, the Russian politician who heads that program. Many of us, over the years, have appreciated Rogozin’s acerbic wit, and his unquestioning patriotism. But is he actually doing a good job at RosKosmos? That is the question here. Merinov himself seems to believe that Rogozin is not the problem. Rogozin is trying to deal with the problem. The 108 minutes which constituted man’s first voyage into outer space, shook the world to its core. That event took place on April 12, 1961. Fast-forward 58 years, and there is talk of space-tourism: RosKosmos is floating the idea of having paying tourists repeat Gagarin’s flight. Rogozin: “We are considering letting people fly around the Earth on the Gagarin route, after a short training period.” This would be a one-day excursion, the tourists would fly around the Earth on a Soyuz rocket, but without a visit to the Space Station. Gagarin himself never got to fly on a Soyuz. He was the understudy for Vladimir Komarov, whose flight on Soyuz-1 ended tragically on April 24, 1967. Komarov was the first human being to fly into space twice, and also the first human being to die in a space accident. His death shook the cosmonaut corps, but also pointed out the need to be more rigorous in the pre-flight checklist. A year after this tragedy, Gagarin himself died in an aviation accident; he was only 34 years old. Despite these setbacks, the Soyuz program was successful on the whole. 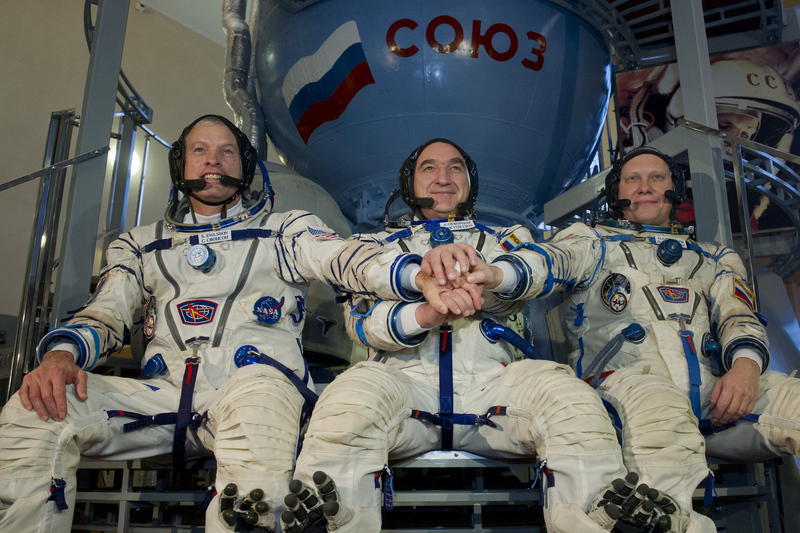 Soyuz missions still carry people and materials up to the Space Station. Yury Alexeevich! 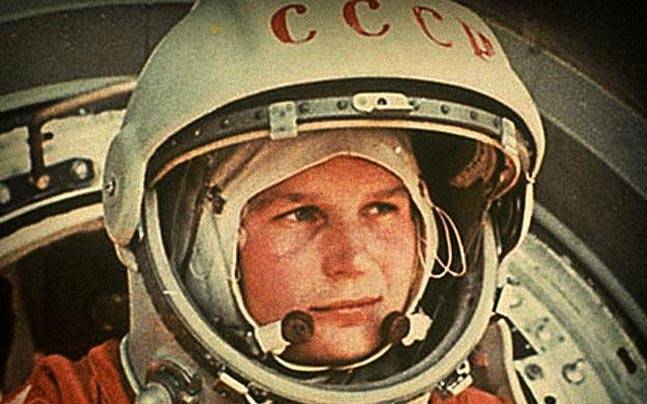 Almost 58 years have passed since your historic flight, and during those years no Soviet or Russian cosmonaut has set foot on the surface of another planet. We didn’t even make it to the Moon, let alone Mars. 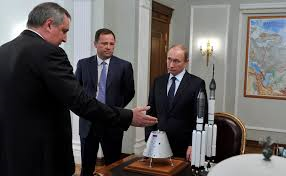 Rogozin shows off his model rockets to a dubious-looking Putin. Rogozin added, in his essay, that “All the major technical achievements which we possess today, were accomplished by Soviet builders, scientists, technologists, engineers and workers,” and this is a true statement. Take the P-7. The very first multi-stage rocket and the grandmother of the “Soyuz” family. This hard-working rocket has been serving the cosmonauts for more than 60 years. Not every technical achievement can boast such a long life. And to this day, various versions of the Soyuz carry crews and equipment up to the Space Station. Today’s cosmonauts, unlike Komarov, pilot Soyuz-es featuring reliable safety systems. Our rocket engines the RD-180 and RD-181 are sold to the United States. Rogozin is driven into madness by this, but for the sake of truth one must admit that Russia is losing the game to the United States and China, even on the market for space-flight services. For the past 7 years now, Russia has not been able to dispatch to the Space Station the multifunctional laboratory module “Nauka”. And nothing has been happening with the plan to build a new spaceship called “Federation”. Which, by the way, Rogozin wants to change the name, because in Russian Федерация (“Federatsia”) is a feminine noun, and he wants something more masculine sounding. American astronaut Steven Swanson, left, training with Russian cosmonauts, in 2014. Meanwhile, the USA has been using our “Soyuz” rockets since 2011 to transport their astronauts to the Space Station, while working feverishly on their own version of a pilot-able spaceship. And their first test has been a success: the 7-man spaceship called Crew Dragon, created by Elon Musk’s company, completed an automated flight to the Space Station, docked, undocked, and flew back down, to land in the Atlantic Ocean. This experiment was a great success. And, by the way, it is Musk’s SpaceX company, with its Falcon-type carriers, which is pushing Russia out of the space-services market. This fact was confirmed in an official report of the Russian government. To be sure, Rogozin does not see a critical lag between Russia and NASA, in the technology arena. Responding to a question on Twitter, he wrote: “There is no critical lag. There is a certain loss of momentum in the development cycle over the past 10-12 years.” However, Rogozin believes that the lag could become critical if Russia doesn’t get its act together and move to the newer rocket technology. As for the Moon: Russia does in fact have a program to go there. The estimate is around the year 2040. Previously Rogozin had promised to start sending equipment to the moon in 2021. Rogozin’s fervor was somewhat checked by Prime Minister Medvedev, who tersely recommended that Rogozin occupy himself with the regular business of RosKosmos and stop babbling on about Russians flying off to various celestial bodies in the near future. This entry was posted in Space, Science and Technology and tagged Dmitry Rogozin, Yury Gagarin. Bookmark the permalink. The less said about Rogozin the better. He makes for good hype, but the rest? Yes, Russia has its space problems but I believe it has passed the ‘hump’. Regardless of how well funded its space program is, there is clearly much more international competition – as you pointed out – , China with its huge resources, but I’m not willing to write Russia off so easily. I think part of the problem is in this internet age is patience, i.e. if we don’t see something happening quickly then it is some kind of failure and looks bad compared to others. This is literally the long haul. Russia’s investments in infrastructure and taking time with its designs I think will still leave it decently placed on the space scene. I hope you’re right, Al. I like Rogozin as a person, but I don’t think he is good for this job. They need to put an engineer in there, somebody with strategic vision.